Best Photo Booth in Dallas! 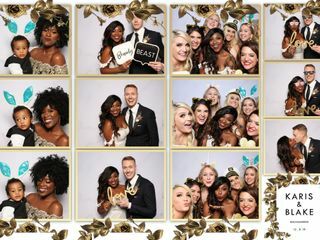 From experience, I can attest that The Social Production is one of the best Photo Booth Rental companies in Dallas, Texas! 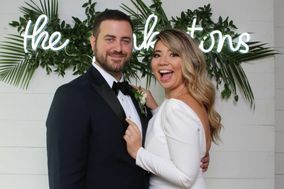 From the expert set up of the backdrop and pro lighting... all the way down to the sharp suit and tie that photo booth attendant was wearing! All of our wedding guests were surely impressed! (Bride and groom included) It was very important to us to make sure that our guests were entertained the whole night of our wedding reception. As soon as the photo booth was set up, everyone flocked to it! The cool props, the quick prints, and the expert lighting was unbeatable, and we highly recommend it! What a cool way to save your special memories and also provide a custom party favor! Social Production was so easy to work with and due to circumstances of rain they moved their set-up into a spare room which turned out to be amazing. They work with you to create a template especially for your event based off of your invitation. 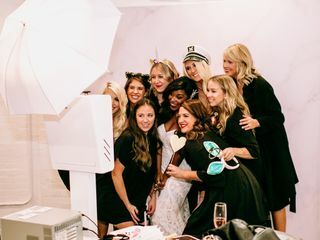 I loved working with them to really turn the photo booth experience into something so fun for my wedding. I would definitely recommend them/use them as a vendor again! 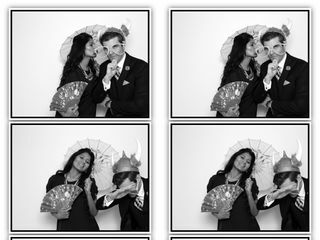 Initially I was leery about booking any vendor online, never having met them, but having a photobooth was a MUST! The Social Production was the first vendor I secured and I am glad I did. Bryan and his crew are great! They guided me through the necessary steps and remained in constant communication even when booking 12 months in advance. The photobooth was a MAJOR hit with my family and friends as well!!! And it was such a surprise to receive the photos from all those who took advantage of the booth! 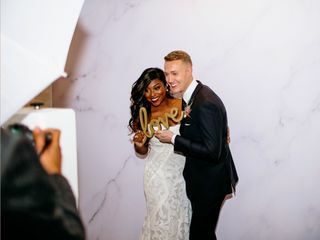 If I had to re-live my wedding day I would definitely call the Social Production! Thank you guys! They are simply the best. Their service is AWESOME!!!! Easy to work with. They updated me on changes. There when I had questions. The attendant who arrived was a delight with our guest. It was so much fun! They really do bring the excitement to your wedding. The attendant was super helpful and friendly. Not sure if there is always two attendants but the ones we did get were very professional and clean looking with their matching Polo Shirts. I loved that we got an Enclosed Booth because that allowed my guest to get silly ( No one wants a Photo booth who has a guy/girl taking your picture while you are trying to looking funny) They arrived one hour early for set up and where ready once the program started over all great service, If you are in the Texas area I Totally would recommend! On time and ready. Loved how they treated our guest. They went above and beyond to provide great service. I would book again any day! Expectional service, quality product, professional. What more can you ask for. My wife and I loved it. I recommend it to all. They kept me updated and confirmed with me several times before my wedding. During the wedding, they were set up ready to go and everyone enjoyed it. The attendant was super helpful and friendly. They were in The Social Production Polo Shirts (super cool) and professional. Afterwards, they were really quick about sending our DVD out and having the duplicate pictures. Totally would recommend! 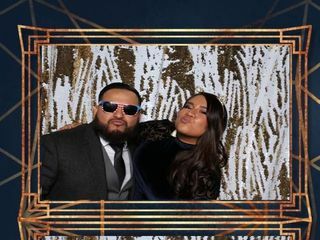 Rented the photobooth and for my friends wedding. They treated our guest with the utmost respect. The owner and his staff are so kind and humble. I say don't think twice and book them. Loved The Social Production Photo Booth and all the props! Satisfied & happy that they were apart of our amazing wedding. Thank you so much! Used them for my sons birthday party. The Social Production was recommended by a friend. My kids loved it. Such a memorable experience they created for us. They are very easy to work with and respond quickly to any questions you may have. I was able to buy the photo album they sale which was one less thing to worry about. They also made my SNAPCHAT filter and all my friends and family loved it. I would not hesitate to use them in the future.